Cult classic -architecture / urbanism...a revolutionary case study that opened the world's eyes to vernacular architecture and iconography-the "ugly and ordinary" structures and signage born to satisfy the needs of regular people, not architects. Venturi Scott Brown are now an important Architectural firm with buildings at Harvard, Michigan, Yale and Tsinghua University Beijing. Robert Venturi is often referred to as the "father of Post Modernism." "Melissa Urcan: I would first like to ask you about the weight of Learning from Las Vegas, now almost 35 years old. Do you feel tied to the association of your work to this book, or is it something you continue to draw from? Robert Venturi: Since then we have written an essay called "Las Vegas After Its Classic Age," which emphasizes that Learning from Las Vegas in the context of now is completely historical. If you had written a book on the Renaissance in Florence, it would have taken maybe 100 years to say, "Oh that's historical." Now you can say 35 years have gone by very fast. 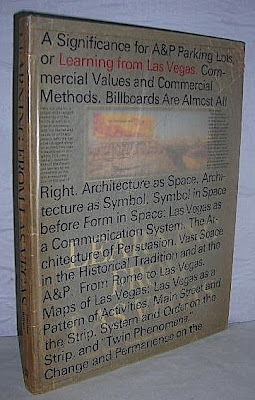 But Learning from Las Vegas is still relevant in many ways, such as in its recognition of the relevance and significance of iconography and signage more than of space. Las Vegas got us in a lot of trouble, but we learned a lot from it. 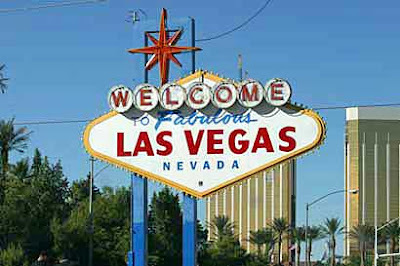 MU: The Strip in Las Vegas appears to be where you spent the most research time. In this book you had the premonition of the building and sign eventually merging. Did you have any idea how big the entire city would become? Denise Scott Brown: We did concentrate on the Strip, but not only on the Strip. We studied patterns of land use throughout Las Vegas. And we mapped all the strips of Las Vegas, not just the famous Strip. RV: In the essay "Las Vegas After Its Classic Age," we say the obvious-that the Strip evolves into the Boulevard. The former Strip is now officially "the Boulevard." I love the use of the word "scenography"-in a sense Las Vegas is now City as Scenography; it's a Disneyland. Most cities are to some extent scenographic, but few are as explicitly theatrical. VALUE? The book has been reprinted and can be picked up for $30 but the 1972 first is now quite scarce. There are 4 copies on ABE at between $1800 and $4500. A copy appeared in auction at Bloomsbury in London last week, singly lotted for the first time in its book auction history. It was a reasonable copy in d/w and made £950 in a rather costly art book sale. I will certainly be adding a link on my blog. Thanks for the great info. Found this book in uni library and there are scribbles inside of it. Clearly not many people now how much this book is valued or how much better it is in a comparison to the reprint. The reprint is just not anywhere as good.